We all know people who have a side gig. More people today are trying to make money without giving up their day job. 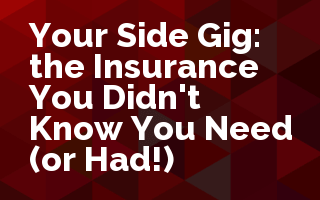 Join us as Kevin Amrhein takes us into the intersection of our customers' side gigs and their insurance policies. He'll be looking for gaps that are created by a side gig. Technology has made it easy for virtually everyone to monetize virtually every moment and everything in their life. The allure of that cash (and the innovative efforts to get it) often leaves traditional insurance policies in the dust. This can cause uncovered claims which quickly eats away at those extra earnings. This course helps insurance professionals learn about evolving exposures in and coverage concerns with a culture obsessed with monetization.